Deciding what kind of dentures is best for you is a personal choice that you need to make with the advice of your dentist. There is a fixed bridge, which as the name implies is a permanent restoration that you do not remove from your mouth. Alternatively, an overdenture that attaches to dental implants and is removable may be a better option for some patients. Dr. Mark Gray, who provides general dentistry in Houston, will be glad to meet with you, examine your mouth and help you make the right decision about dentures. Also called fixed bridgework, this prosthetic is convenient, comfortable and attractive. For patients who are edentulous—have lost all of the teeth along the upper or lower arch—but who have not lost a significant volume of bone tissue in the jaw, this tooth replacement option can be ideal. A fixed denture provides the appearance and function of real teeth but does not offer cheek and lip support if needed. A removable denture is also know as an overdenture because it fits over dental implants and can be removed for cleaning. Whether a removable denture or a fixed denture is right for you will depend on whether or not bone loss accompanies your missing teeth. In this case, a fixed bridge may not be possible; alternatively, a removable denture offers support to the remaining bone, gum tissue, lips and cheeks so you have a more natural looking facial appearance. Aesthetics. 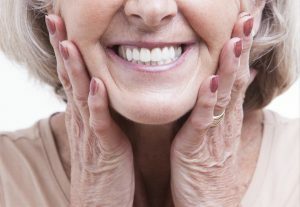 If there is bone loss in your jaw, then an overdenture can provide stable support for a more harmonious facial appearance. Speech. A good denture can impact your ability to speak clearly. All dentures, especially those along the upper arch, can alter your speech. However, most patients who’ve worn both fixed and removable dentures find that their speech is better with a removable overdenture. Hygiene. A removable denture allows for cleaning the gum tissue that surrounds dental implants. This may actually help to preserve existing gum and bone tissue. Ease of Maintenance. For both you and Dr. Gray, a well-designed overdenture is often easier and more cost effective to maintain.